Every year, the President of the United States delivers a "State of the Union" message to the U.S. Congress. These texts express global shifts and changing political moods. 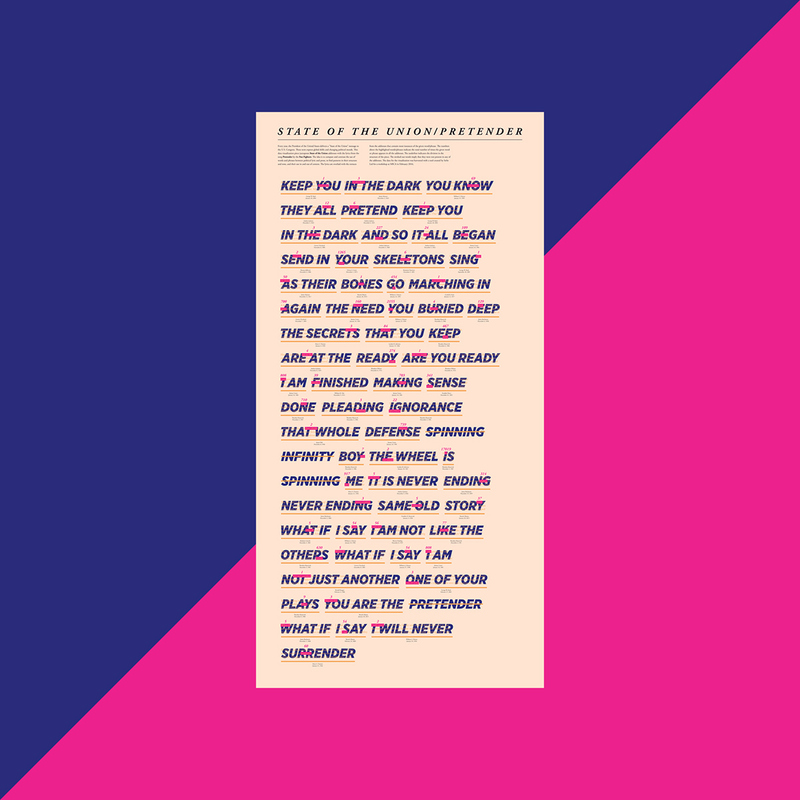 State of the Union/Pretender piece juxtaposes State of the Union addresses with the lyrics from the song Pretender by the Foo Fighters. 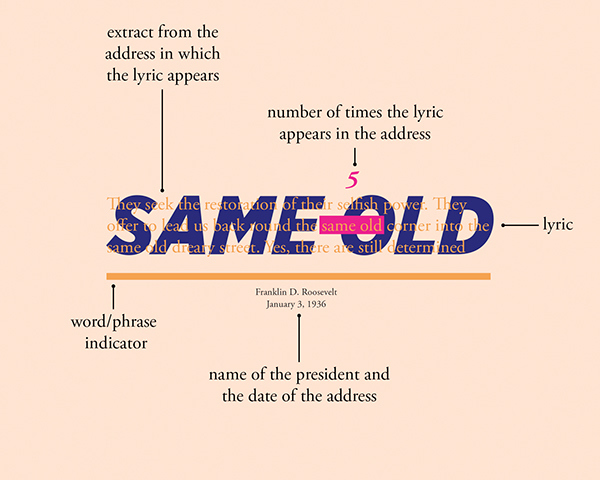 The idea is to compare and contrast the use of words and phrases between political lyric and prose, to find patterns in their structure and tone, and their use in and out of context. 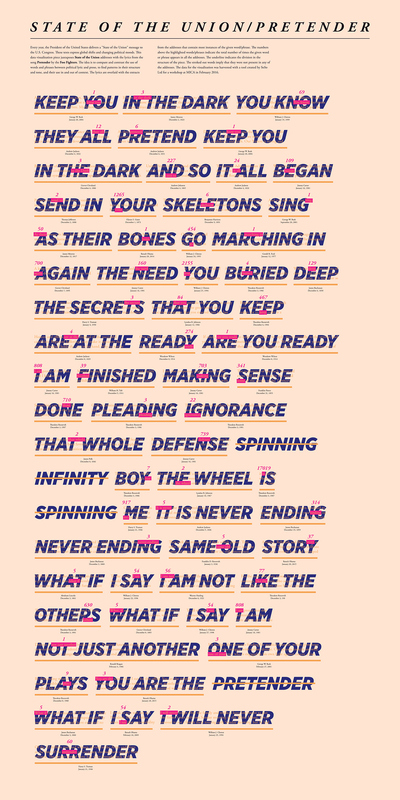 The lyrics are overlaid with the extracts from the addresses that contain most instances of the given word/phrase. The numbers above the highlighted words/phrases indicate the total number of times the given word or phrase appears in all the addresses. The underline indicates the division in the structure of the piece. The stroked out words imply that they were not present in any of the addresses. The data for the visualization was harvested with a tool created by SoSo Ltd for a workshop at MICA in February 2016. Shout-out to Eric and Jackie from SoSo Ltd for this brilliant workshop. A data visualization project created for the weekend workshop conducted by SoSo Ltd. at the Maryland Institute College of Art.